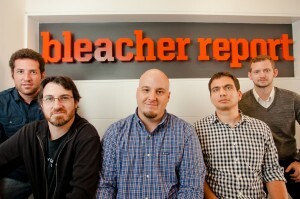 A quintet of blogging stars make their debut today as Bleacher Report embarks on, no exaggeration, a whole new era. If you don’t speak press release, what that means is that we now have five pros heading up our coverage of national sports, the NFL, the NFL draft, the NBA and college football, and they’re pretty cool guys. One of the five is NFL draft expert Matt Miller, who has come up through the ranks at Bleacher Report, earning nearly 3 million reads on almost 300 stories since he joined the site as a contributor in November. Part of the Lead Writers’ mandate will be to help identify the new Matt Millers, those members of the Bleacher Report writing community who are doing great work and could be in line for paying opportunities. We also think having these accomplished writers on board will provide a boost for Bleacher Report’s reputation, and that should be helpful to the entire writer base. Here’s a very short bio of the five new Lead Writers. Click on their names to read their first pieces for B/R. and his work has been featured on NFL.com, SI.com and USA Today. NFL, CFL and AFL teams have also used his scouting services. Noted contrarian Josh Zerkle is the NFL Lead Writer. He’s the co-founder of the popular NFL blog Kissing Suzy Kolber and a former contributing writer for Deadspin and WashingtonPost.com. He works fast, he works funny, and he works at making select people mad. Dan Rubenstein brings his multimedia talents to Bleacher Report as the College Football Lead Writer. Rubenstein rose to Internet fame as host and producer of the SI Tour Guy video series for Sports Illustrated, in which he traveled to college football tailgates and made fun of people, who seemed to like it. He’s now the co-founder and co-host of The Solid Verbal, the Web’s most popular independent college football podcast. Bethlehem Shoals, the new NBA Lead Writer, is the founder of the hugely influential NBA blog FreeDarko and the co-author of FreeDarko’s two books, “The Macrophenomenal Pro Basketball Almanac” and “The Undisputed Guide to Pro Basketball,” the latter of which, along with a textbook called “News Reporting and Writing,” is propping up your humble writing program director’s monitor—a position of honor. This is really great to see. Shows that B/R is willing to look at the, um, constructive criticism out there, analyze what it is doing, and evolve. This is an incredible crew. Happy for all you kids, and I know you’re going to kill it!!! We plan to wear very short shorts, ushering in a new revolution in sports writing attire. Welcome to all. This is a great decision by Bleacher Report. Hey, welcome all! Ready for some football? I don’t know if B/R realizes just how critical of a move this is for guys like me. I’ve been a sports blogosphere nut for the past two years. I’ve idolized guys like Shoals, J.E. Skeets, Dan Levy, Kelly Dwyer, MJD, Jamie Mottram, Trey Kerby, and the rest of those bloggers. I still can’t get enough of them. I aspire to become one of them. I hesitated with the B/R thing, but I knew this site is damn near unavoidable. Interestingly enough, I dug it, but not enough to stop wanting to be a blogger. I’ll watch this new group rigorously and learn whatever the hell I can to get to the level these dudes are at. I’m excited, but I’m also very nervous … and I’m not even the one writing.